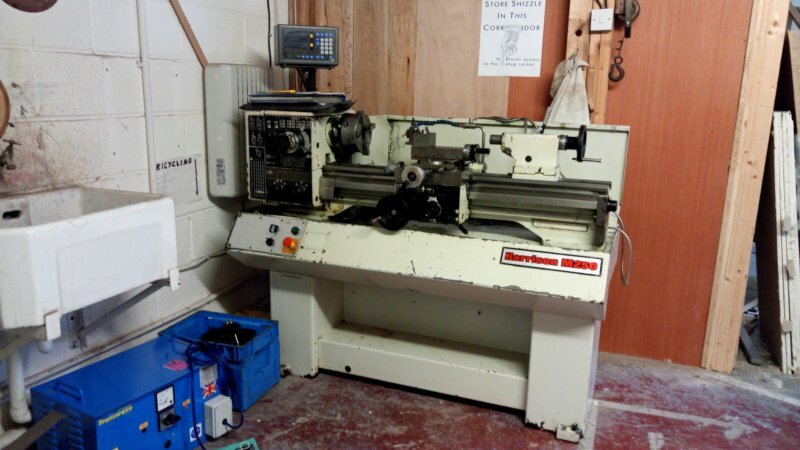 The Harrison M250 lathe (also sold as Colchester Bantam with a different gear change and control lever layout) was designed to appeal to schools, training establishments, repair shops and those needing a strong, properly-built but compact lathe for light production work. The M250 is a full-function machine capable of the entire range of turning operations, and through the available range of accessories its scope and versatility can be increased even further. Quality, reliability and response make it one of the most outstanding lathes of its kind especially in industry, the toolroom, training and secondary and tertiary education. Detailed review and discussion of Harrison M series lathes. Only paid up members of Bristol Hackspace may use the lathe or receive an induction. Link to induction notes, TBA. The lathe is new so we have minimal tooling for it. This is a wish list of ESSENTIAL TOOLING to get us going that will eventually become a purchase proposal when the time is right. Safety must be adhered to at all times. Daily maintenance is to be carried out on each occasion the lathe is used. Maintenance other than daily maintenance may only be carried out by personnel in the maintainers list. In the event of anything urgent please contact someone from the committee. You may not use the lathe if you have not been inducted and are not on this list. Persons not on this list may not carry out inductions. Friendly help and helpful advice is encouraged. Contact for induction via members forum. Persons not on this list may not carry out modifications or maintenance not on the daily check list.